Apostasy is an important yet often neglected subject when attempting to comprehend what the Bible teaches about the end times. Thus, this series of articles is dedicated toward tracing ten general, biblical characteristics of apostasy. In the previous articles, apostasy was defined as a movement within Christ's church representing a departure from known truth. It was also established that apostasy is the central sign revealed in Scripture signaling the near completion of the church's earthly mission. It was also shown that warnings against apostasy consume much of the New Testament and that these New Testament warnings relate to virtually all of Christianity's most cherished doctrines. 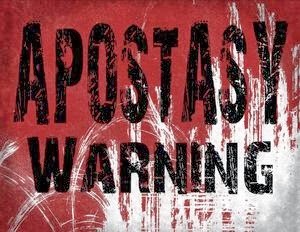 Apostasy is also a phenomenon that occurs internally within the church and even is led by individuals or groups considered the least likely candidates to depart from truth. This article will attempt to develop two more characteristics of apostasy: its speed and satanic influence. Another characteristic of apostasy is the speed or haste in which it can transpire. Apostasy need not take several generations to occur. Galatians 1:6 says, "I marvel that you are turning away so soon from Him who called you in the grace of Christ, to a different gospel” (italics added). When Paul wrote to the Galatians, he expressed shock or surprise on two grounds. First, he was astonished at how quickly his readers had deserted the truth that he had imparted to them. Second, he was amazed that the Galatians had parted company with him on the very gospel itself. They did not disagree with Paul on some tangential or minor issue but rather on the core nature of the gospel, which represents the heart of Christianity. A natural question arises. How long of a period of time elapsed in between Paul's initial contact with the Galatians and when Paul addressed them in his letter? Most modern New Testament scholars hold to what is called the Southern Galatian Theory. According to this view, Paul evangelized and planted churches within the area of Southern Galatia (modern-day Turkey) on his first missionary journey around A.D. 48. He then wrote to these same churches upon his return to Syrian Antioch after the conclusion of his first missionary journey. Therefore, Paul wrote to these same churches about one year after his original contact with them. Paul penned the letter out of concern that the new Galatian believers had shifted theologically. Although they had experienced salvation through faith alone in Christ alone, they had begun to embrace the false teachings of the Judaizers that sanctification could be achieved through a mixture of faith in addition to obedience to the Mosaic Law (Gal. 3:3). Paul spends the entire letter to the Galatians seeking to rescue them from this error. The important point to recognize here is that the very churches that had heard Paul preach and even saw his miracles (Gal. 3:5; Acts 14:3, 8-11) had departed dramatically from critical Pauline gospel principles within a short duration of time consisting of about one year. Thus, the speed at which apostasy can occur cannot be overstated. In the previous article, reference was made to the golden calf incident (Exod. 32:1-10). There, Israel while encamped at the base of Mount Sinai apostatized from God at the very moment Moses was atop Mount Sinai receiving God's Law. As in the case of the Galatians, this turning away from God did not represent a departure over some minor issue. Rather, it represented apostasy from the fundamental issue of monotheism. When God brought this issue to the attention of Moses on Sinai, He made reference to the speed at which Israel had apostatized. Exodus 32:8 says, "They have turned aside quickly out of the way which I have commanded them" (italics added). Apparently, Moses had been on Sinai for only 40-days (Exod. 24:18) and it was during this short time period that Israel apostatized on the fundamental issue of the true knowledge of God. Again, the speed at which apostasy can occur should be noted. While it took the Galatians about a year to depart from the core principles of the gospel, it took Israel only 40 days to depart from God by lapsing into idolatry. The speed in which apostasy can take place also finds illustration in Christ's words to the church at Ephesus. The previous article noted Christ's rebuke to the Ephesian church, which had forsaken its first love (Rev. 2:4-5). Again, the foundational nature of this departure deserves notice. Like the Galatians who had left the core principles of the gospel and Israel who had forsaken monotheism, the Ephesians had allowed other pursuits to eclipse their initial love and devotion to Christ. Interestingly, Paul had earlier addressed the church at Ephesus around A.D. 60. Paul's epistle to the Ephesians was written from Rome during his first Roman imprisonment and constituted the first of his four "prison letters." The letter to the Ephesians fails to reveal any clue of a major defection taking place within the church. Yet when Christ addressed the same church in Rev. 2:1-7, the church looked entirely different since it had abandoned its first love. While, as mentioned above, Paul wrote to the Ephesians in A.D. 60, it is traditionally believed that John on Patmos received and recorded the vision that subsequently became known as the Book of Revelation in A.D. 95. Thus, within just three and a half decades (from A.D. 60 to A.D. 95), the church at Ephesus had departed on the foundational issue of love and devotion to Christ. In sum, while it took the Galatians one year to abandon the gospel and Israel 40 days to abandon monotheism, it took Ephesus less than four decades to neglect its first love. All of these biblical examples illustrate the speed in which apostasy can occur. The rapid speed in which apostasy can occur was first driven home to me as a new believer. I became a Christian in 1983 through a home Bible study affiliated with a Bible teaching church. This wonderful church then nourished me in my newfound relationship with Christ during most of my high school years. I then temporarily left the church for a few years in order to attend college and graduate school in another area. Upon my return to the church just a few years later, I found an entirely different church due to an interim change in ministry philosophy. No longer was the Bible taught except in a highly selective fashion. Concepts such as the realities of sin, hell, and the exclusivity and blood of Christ were omitted from the church's teaching ministry all in the name of not wanting to offend the unchurched. God used this experience to open my eyes not only to the reality of apostasy but also to the speed in which it can occur even in spiritual environments once considered fundamental and secure. Who ultimately is behind apostasy? The following verses divulge Satan as the true culprit. 2 Corinthians 11:3 says, "But I fear, lest somehow, as the serpent deceived Eve by his own craftiness, so your minds may be corrupted from the simplicity that is in Christ" (italics added). Here, Paul expresses concern that just as Satan led Eve away from God's simple command not to eat from the forbidden tree, Satan might similarly lead the Corinthians into apostasy. 1 Timothy 4:1 similarly notes, "Now the Spirit expressly says that in the latter times some will depart from the faith giving heed to deceiving spirits and doctrines of demons" (italics added). The adverb "expressly" indicates the Spirit's earnest desire to convey an important truth. This important spiritual reality is that demons are the ultimate source of power behind the last days apostasy of the church. Do men or Satan cause apostasy? The answer to this question is "yes" since both alternatives are true. Satan places ideas into the minds of fallen men typically in positions of ecclesiastical influence in order to push the church further into apostasy. Satan even uses believers in order to accomplish this endeavor. Satan's ability to use carnal believers, or those who cater to their sin nature, is apparent from the following passages. Christ rebuked Peter for giving verbal expressions to satanic thoughts. Christ's rebuke occurred when Peter attempted to persuade Christ not to die on the cross (Matt. 16:23). Later, Peter noted that Satan had filled the hearts of Ananias and Sapphira thereby prompting them to lie to the Holy Spirit (Acts 5:3-4). It seems evident that Ananias and Sapphira were believers since their sudden deaths struck fear into the hearts of the rest of the church (Acts 5:11). Such fear probably would not have overtaken the church had Ananias and Sapphira been unbelievers. The early church likely reasoned that if two of their own could be severely disciplined by God then the rest of the church could be similarly disciplined. Also, Paul exhorted the Ephesian believers not to harbor bitterness and instead to forgive. Otherwise they would give Satan a place of influence in their lives (Eph. 4:26-27). Thus, these passages all seem to indicate that Satan has an ability to negatively influence the lives of carnal believers. Why would Satan want to use Christians in spheres of influence within the church to cause the church to depart from truth? Satan's ambition has always been to push the church into apostasy so as to get it off message and outside of her divine purpose. Once the church becomes something that God never intended she quickly loses her effectiveness in the world. God's purpose for the church is threefold: to glorify God (Eph. 3:21), to edify the saints (Eph. 4:11-16), and to accomplish worldwide evangelization and disciple making (Mark 16:15; Matt. 28:18-20). The church operates with power only to the extent that she functions within her divine design. Once the church moves outside of these divinely designed guidelines she loses her power and effectiveness. This reality explains why Satan is the ultimate cause of apostasy. If Satan through apostasy can cause the church to take on tasks that God never delegated to her or become something that God never designed her to be then he will have crippled the church in accomplishing her earthly mission. Ephesians, Colossians, Philemon, and Philippians represent Paul's prison letters. For a defense of Revelation's A.D. 95 date, see Mark Hitchcock, "A Defense of the Domitianic Date of the Book of Revelation" (Ph.D. diss., Dallas Theological Seminary, 2005).